here is some logs of the transaction..
[Tue Jun 26 14:09:30 2007] a keeper begins to cast a spell. [Tue Jun 26 14:09:35 2007] Your faction standing with Temple Of Sol Ro got better. [Tue Jun 26 14:09:35 2007] Your faction standing with Shadowed Men got worse. [Tue Jun 26 14:09:35 2007] You gain experience!! you don't need to /say the "sell me a fire opal" part first.. you can just give her 55 plat. giving her 110 didnt work though for 2 at once. east side of the temple for us /loc challenged folk. Leader of the Destiny of the Gnomes. I looted something called a Hope Fire Opal from a mob in the tenebrous mountains. I couldn't seem to find it listed...anyone know what it's for? Hope fire Opal is for the twilight sea quest warrior sword. is this needed for the harvester quest? Got one from an Elder Shardwurm in GD. Don't worry about losing the 55pp, it works. You don't have to give 550gp. Just did it. Genni does indeed sell a fire opal for 55pp worth of coin. First say to her 'Sell me a fire opal'. She replies that she will sell you a fire opal for 550 gold coins. You can give her any combination of coins that totals 55pp and she will give you a fire opal. You also get positive faction with the Temple and negative faction with shadowed men, and a small bit of exp. I understand that is it drops off of the AC in OOT, but I'd just buy it from the person in Sol Ro. HUGE time saver. 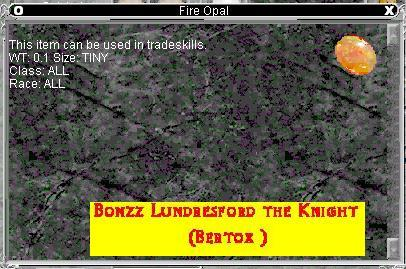 fire opals also are sold in north freeport. Go to eqtraders and click on freeport map. it should be listed as item 10, the big blue building. The vendor is upstairs. she also sells lots of other gems including star rubies, and fire emeralds. I bought the fire opals for 51pp but my "cha" was 140 so you may not get it for that price but at least it is accessible in north freeport. Ummmm then its a rare drop off of him, and he is a damn rare spawn ( anyone with J-boots can relate) Fire opals can drop off of any mob that level i think. They sell in the stores for 62pp (my cha is 60). after the patch, all of the merchants stock was wiped clean and now i need one. If you are on Luclin, send a tell to tangurena. im looking for some. I understand that a merchant in Teple of Soullusk Ro sells these. If u go to EQatlas.com and check out Temple of Soulussk Ro.... then check number 10 on map, Genni, that NPC sells this item. If i were u i'd buy the friggin thing no way wait a year for NPC drop. I understand they run for UNDER 100 pp and if u ask me it's more efficient to buy it and make back that money instead of spending hours to get NPC drop and safe the 60 or so pp. Hehe but that's just me ). Good luck with it.